The ancient Incas created a vast network of roads and trails that they called Capaq Ñan. Today you can still hike on parts of this Incan road system that are paved with the original stones that were placed there by the Incas. 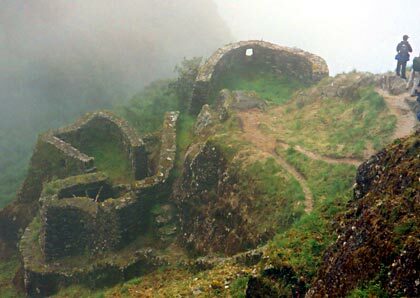 The most popular of these Inca trails for hiking is the Camino Inca to Machu Picchu. This ancient Incan trail starts near the town of Ollantaytambo in the Sacred Valley and ends at Machu Picchu, the most famous ancient ruins in South America. Some say that this Inca trail is more incredible than Machu Picchu itself, in that there are numerous amazing ruins along the trail proper. Thousands of hikers from around the world make the trek each year with the assistance of Peruvian porters and guides. 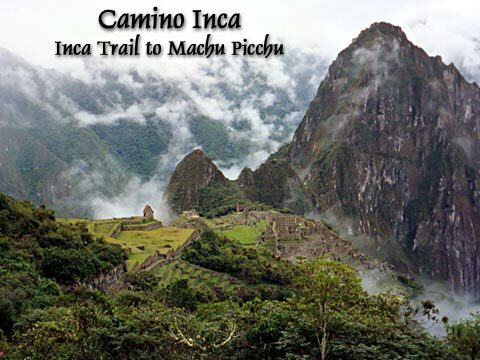 Camino Inca is Spanish for Inca Trail and there are actually three different routes to the Machu Picchu Inca ruins: The Classic Inca Trail (or Four-day Trek), the Sacred Inca Trail (or Two-Day Trek), and the Salkantay Alternate Trek. The Classic Inca Trail and Two-Day Treks both meet up at the Wiñay Wayna ruins and then proceed to the Inti Punku, the 'Sun Gate' where trekkers get their first glimpse of Machu Picchu in the distance. The Salkantay Alternate Trek is the longest of the three and generally ends up below Machu Picchu in the Village of Aguas Calientes rather than at Machu Picchu proper. Transecting the Andes mountain range and the upper Amazon Rainforest, the Classic Trail passes many important Inca ruins and outposts before ending at Machu Picchu mountain. The two longer routes (Classic Trail and Salkantay) require an ascent to over 13800 ft (4,215 m) above sea level, which can sometimes cause altitude sickness. This 30 mile (48 Km) Classic Inca Trail attracts many backpackers from all over the world who want to hike this ancient, scenic path to the ancient site of Machu Picchu. The Inca Trail wanders over high passes, offering incredible vistas of mountains with glaciers and the bright green valleys of tropical rain forest. Along the Inca Trail, you will encounter prehistoric Incan stonework and abandoned settlements and sentinels until you arrive at the end of the trail at Machu Picchu. Just before you arrive at the sacred site of Machu Picchu, you will pass through the Sun Gate, just as the ancient Incas did over 500 years ago. This trek involves substantial climbing (some passes are 14,000 feet in elevation), especially during the second day of the hike, and takes about 4 days. Recently, new regulations have been implemented by the Peruvian government in an effort to reduce the damage to the Inca trail caused by erosion due to an excess number of hikers. Current regulations put a limit on the number of people that can hike the Inca Trail each season, and have limited the number of companies that can provide guided tours. 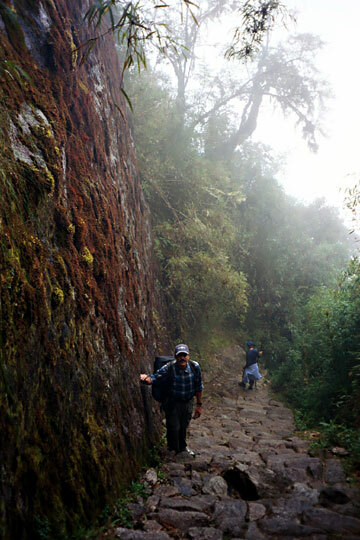 Moreover, independent trekking on the Inca Trail is no longer permitted and the use of commercial guides is mandatory. During the peak season (June through August), advance booking for the Camino Inca is generally required. By May, all reservations are generally booked as a maximum of 500 people (about 200 hikers and 300 porters and tour guides) are allowed to be on the Inca Trail on any given day. During the winter, rain storms can literally wash out the trail, and the Inca Trail is closed for the entire month of February for maintenance and cleaning. For more photographs and information on the various indigenous people and tribes of South America (and the world), please visit Amazon-Indians.org, Amazon-Tribes.com, Amazonz.info, Matses.info, IncaTrails.org, and IquitosNews.com and FriendsoftheAmazon.org. To learn the "ins and outs" of how you can arrange and book a tour to hike the Inca Trail, please visit Camino Inca's new Inca Trail Forum. In the Inca Trail Forum, you can learn who are the best tour operators and how to obtain the best deal possible. Please feel free to share your Inca Trail experiences in the forum.